If you are in downtown Chicago and haven’t yet viewed the impressive architecture it’s a must. But there’s more to see. 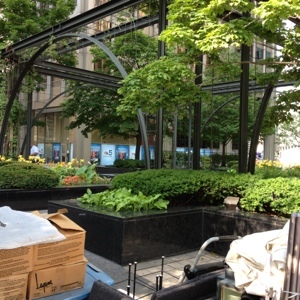 For several years now it’s no secret that some of the best fine art is being exhibited at this time of year on the plaza at the Tribune Tower. There’s a pleasant stroll awaiting you and many friendly artists from all over the USA. If you need a gift, want access to handmade original art for your home or garden, or just want to feel inspired, The Tribune Tower art fair has to be on your agenda! Come visit the art on the plaza and then Bruce & Christine in Space 47! Next Post Do you eat art fair food?